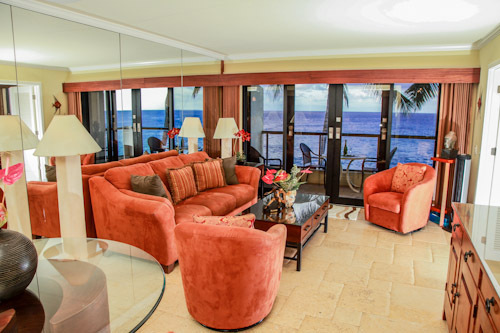 No expense was spared in making this a suite where your tropical dreams come true. Opulent bedding, upscale furnishings and an elegant bathroom complete your island retreat. The en suite walk-in travertine shower area is pleasing, and quality linens complete the picture. This room is fully air conditioned! The ocean symphony will rest your weary mind and body in the oceanfront paradise that is your bedroom. There is an air conditioning unit that exclusively services this master bedroom. Your luxuriant holiday in Poipu, on Kauai. Colorful décor with natural elements work to create a refined environment for when you are back “home” from exploring the delights of the Garden Island. The living room, dining room and kitchen are complete with air conditioning. 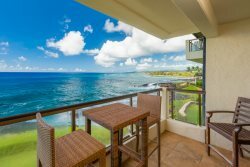 It will be hard to shift your eyes from the mesmerizing ocean drama from the lanai, but there is a 42" flat screen plasma tv if you need to confirm that the other world still exists. Plug in your own tunes on the Sony home theater and know that life is good. Of course, free wireless internet for your use. Dining in is easy, comfortable and the views are far better than most restaurants. The gas BBQ grills make that fresh island catch even more tasty. The rich African Mahogany cabinets are artwork alone, but with the addition of dramatic granite and the fully equiped kitchen, cooking while on vacation is an enjoyable experience! Quality GE Profile appliances are top of the line. Your morning tea, coffee or juice never tasted so good while sitting on the lanai enjoying dolphins, giant sea turtles and (in season) the humpback whale migration. End the day with your own concoction, sunset will be beautiful from your own “best seat in the house.” Reservations required! The second bedroom has twin carved teak beds. The bathroom is large and accommodating, with the helpful addition of a GE high efficiency full sized washer and dryer. The flat screen tv allows for privacy for all. Bring your dvd's for this TV to keep the kids entertained. The garden area off this bedroom is your tropical rainforest. Birds sing and the trade winds carry through your room like a tropical balm. Poipu Shores is amazing and worth every penny spent! Simply perfect! I can't wait to get to Kauai each year and I hate leaving. Patricia was a great communicator and an excellent help to us, both in securing the rental and keeping us updated as to our situation. She is the only person that we really worked with. It was fantastic in every way. Thank you!!! All went very smoothly. I felt confident in their timely response and flexibility handling the reservation arrangements. We were very pleased with the goodies in the fridge for breakfast. It was very much appreciated after a late evening flight. Thanks so much. We were also pleased as to how quickly we were able to connect with the team regarding our booking. We loved the unit and the property itself. We saw whales several times a day from the pool or our lanai. At the pool side turtles were constantly in the cove below - it was fun to watch them. The sunsets from this property were wonderful. The waves were loud and people were quiet.